One of the nicest things for The Legal Genealogist about being a speaker and ambassador for the RootsTech conference in Salt Lake City in February is being given one pass to give away to someone who, otherwise, might not be able to attend. 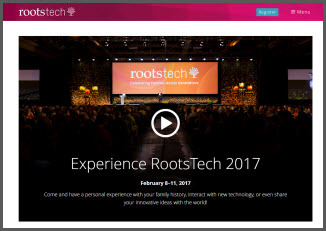 RootsTech, in case you’re not familiar with it, is one of those don’t-miss parties for genealogists, with more than 200 breakout sessions for all levels of experience so that the biggest challenge most of us face is deciding which to attend. The Expo Hall is jammed with exhibitors showing off the newest and best gadgets, gizmos and systems we can use to advance our family histories. And if that’s not enough, there’s the Innovator Summit where new toys and apps and goodies for genealogists have a shot at getting funded so we’ll have them to play with in the future. It’s going to be held at the Salt Palace Convention Center in Salt Lake City, February 8-11, 2017, and it’s always one of the fun high points of the year to see all the people who attend. And boy are there are a lot of people who want to attend — and a lot of great reasons for wanting to go! The contest here on this blog, decided by a random number generator, required entrants to say what one session they most wanted to attend. And their choices will give you an idea of why RootsTech is such fun. DNA is, of course, a big draw with choices including “DNA: The Glue that Holds Families Together” by Diahan Southard, “DNA: Citations, Proof Arguments and Conclusions” by Angie Bush, and “How to Use DNA Triangulation to Confirm Ancestors” by Kitty Cooper. International research is always an important part of RootsTech, and classes in 2017 include “What to Know Starting Scandinavian Research” and ““Where to Find the Stories of Scandinavian People” by Finn Karlsen, “Record Destruction Strategies in Spanish Research ”by Lynn Turner, “New! 2017 Is the Year of Nordic Records! Learn What’s Coming!” by Whitney Peterson, “The Latest on Mexican Research” by Karina Morales, and “Blessings and Curses of Tracing Welsh Ancestry” by Darris Williams. Congratulations to Susan, and looking forward to seeing her — and you?!? — at RootsTech in February. Thanks to you, Judy, and to Roots Tech for providing the pass. Very much looking forward to seeing everyone in SLC in February!